For more information, please contact Megan Daniels, MSE Undergraduate Advisor. E-mail is the preferred contact method. Thinking about WE at Ohio State? The Welding Engineering program provides the mathematics, science, and engineering education needed to function in the welding industry. The welding engineer is concerned with all of the activities related to the design, production, performance, and maintenance of welded products. Interest is primarily in the manufactured or fabricated product, including materials selection, manufacturing methods, tooling, operator training, quality control, performance evaluation, sales, and service. Students interested in pursuing a bachelor's degree in Welding Engineering will begin as "pre-majors" in WE, and should follow the curriculum sheet, taking the required courses in Math, Chemistry, Physics, and Engineering. Students should take MATSCEN 2010 no later than the Autumn before entering the major. WE Major courses begin in the Spring Semester of the second curriculum year. MATSCEN 2010 is offered each year in the Autumn and Spring semesters and has a prerequisite of Math 1151, Chemistry 1250 or 1210, and Physics 1250. The Welding Engineering program at Ohio State offers students the best of all worlds! 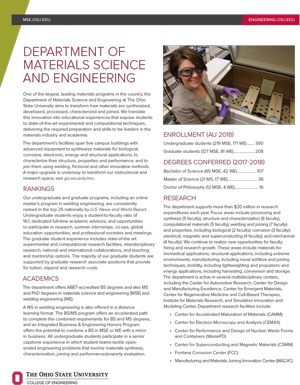 The department is small and friendly, where students interact frequently with faculty and staff and have many opportunities for involvement and research. At the same time, being at Ohio State offers literally hundreds of clubs and organizations and ways to be involved in student life at a great research institution. The Welding Engineering program at OSU is a professional 4-year engineering degree program, and is not a technical welding program. Students wishing to transfer to OSU and to the College of Engineering should refer to the College's admission requirements (link found here). Transfer students with at least 30 transferable semester hours (or the equivalent), including credit for at least one calculus course, and a GPA of 3.0 or higher (on a 4.0 scale) enroll as pre-majors. Transfer students with fewer than 30 semester hours (or the equivalent) are considered using the freshmen criteria. Technical welding courses cannot be used to complete the OSU Welding Engineering degree. Students admitted to OSU with diplomas in Welding Technology or Associate of Applied Science in Welding should expect to spend another 3-4 years of fulltime coursework to complete the Bachelor of Science in Welding Engineering at OSU. Community College transfer students are encouraged to follow the Associate of Science track (calculus, calculus-based physics, and college chemistry) for best transferability to OSU's Welding Engineering program. Community College transfer students are encouraged to follow an Associate of Science track (calculus, calculus-based physics, and college chemistry) for best transferability to OSU's Welding Engineering program. Holders of diplomas in Welding Technology or Associate of Applied Science in Welding who are admitted to OSU Engineering should expect to spend 3-4 years of fulltime coursework to complete the Bachelor of Science in Welding Engineering. See more information to the left, below. The Bachelor of Science in Welding Engineering is not available as an online option. Please see information about the distance Master of Science in Welding Engineering option here.